THE EX, A radical alternative to the typical block o' wood, will revolutionize the way you store your knives. No knife holder has taken a greater stab at the theatrical than this specially designed Ex knife holder. Et tu, Brute?. This 5-piece knife holder is unlike any cutlery set you have ever seen. 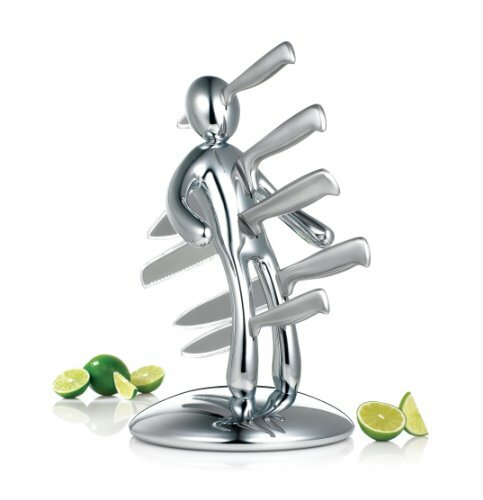 This whimsical, artistic kitchen accessory holds 5 high quality stainless steel kitchen knives (included) in a rather unorthodox fashion - store your knives in an anonymous effigy dedicated to whomever you please. Take out your frustrations as you store your knives. Makes a perfect gift and a guaranteed conversation piece. Plastic casings house every knife to prevent blade exposure. NEW 2nd Edition EX includes protective knife sheathes that are crystal clear and "form fitting"
If you have any questions about this product by RICSB, contact us by completing and submitting the form below. If you are looking for a specif part number, please include it with your message.